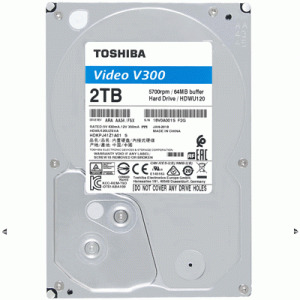 Toshibaâs 3.5-inch V300 Video Streaming Hard Drive with up to 3 TB lets you stream, record, edit and play video content on DVR, TV or NVR â with all the efficiency and reliability you need. A 64 MB buffer helps deliver smooth performance, while temperature control technology limits heat buildup, extending service life for added reliability. A drive thatâs quiet and more efficient than ever, thanks to Toshibaâs Silent Seek Technology, and reduced energy consumption.